If you are thinking of bathroom refurbishment, there are plenty of options. Before deciding any remodelling of this important room in your house, you must consider few factors such as your practical needs, aesthetics, and time at hand for refurbishment and budget off course. You must take care of current needs and future needs as well. To take a most viable decision, you must do some research. You must flip through some interior design magazines, must visit interior designer in your area or you can consult a contractor. This exercise will give you an idea about the latest styles and trends for bathrooms. You can get the idea about various fittings and accessories which can be used in your bathroom. While refurbishing your bathroom, you can choose from a contemporary style and traditional style. If you want a bathroom of contemporary style, you can have sleek finishes like gold, chrome or other metals in the bathroom accessories, fittings, trimmings and colour scheme. For flooring and walls, you may use marble or stone tiles. Basin and bath can be chosen to complement texture and colour scheme of your bathroom. If you want traditional style of a bathroom, brass fittings, gold timber panel or cast iron bath would add to the vintage aesthetics. Then you can add heritage colours and vintage accessories in your bathroom. There is a wide range of accessories, fixtures, fittings and tiles available when you go for selecting one that appeals you. It is up to you to choose the best things which blend well with design of your bathroom. For this, you can visit home shows, local interior design centres and collect brochures of various products. Sticking to your budget is a crucial factor while remodelling the bathroom as there is no limit to spending. Get quotes of all the products you need to incorporate in your bathroom. You also need to contact local contractor in your area. If you are going for major development or reconstruction of your bathroom, you need to take council permissions. After deciding the style and budget, you have to design a layout for your bathroom. Planning ensures that everything is taken care of and nothing is left. It includes things like floor plan, shower vanity, storage space and other design elements. Here are few tips for getting a problem free bathroom. • Cupboards should be made from moisture resistant material like MRMDF (Moisture Resistant Medium Density Fibreboard). 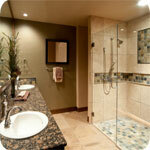 • To minimize the risk of flooding, there should be enough drains in the bathroom. • To make a smaller bathroom look bigger, use large mirrors. • Hand held showerhead offers better flexibility. • Use of Skylights increases brightness and reduces the energy usage. • Leave 10 to 20mm space below the door of the bathroom for better ventilation. So, make plans, do the research and estimate you budget. Ask professionals for advice and help and you will be able to enjoy your beautiful bathroom for long years. Joanna is a well renowned Polish journalist specialising in Polish, Russian and English translation services. She has been residing in the UK for 3 years where she has made her home among the Polish community in Tooting, South West London.